University is a great place to play bridge! Bridge is not just a fun, and mentally challenging game, but a fantastic place to meet people and make new friends - you may even find love! "Bridge has been a great way to meet people who I may not have otherwise met. I have become friends with many of these people, and I even met my boyfriend while playing bridge." "What's better than meeting with friends in the pub, having some food and drinks and playing some cards?!" ...but we would like to see more - see below for details on trying to set up a new bridge club. This is an inter-university teams-of-four knock-out competition, which starts each autumn and runs through to a semi-final and final hosted by the Portland Club in London in the spring. Early matches are zoned to minimise travel. Feel free to view our Youth Calendar page for a list of all upcoming events for junior players. We can produce for you posters to advertise your bridge club, and fliers to hand out to prospective members at Freshers’ Fairs. Help with discounts on a range of bridge stationery and equipment that you may need to buy to run your club. For more details of any of these services, please contact David at EBED. 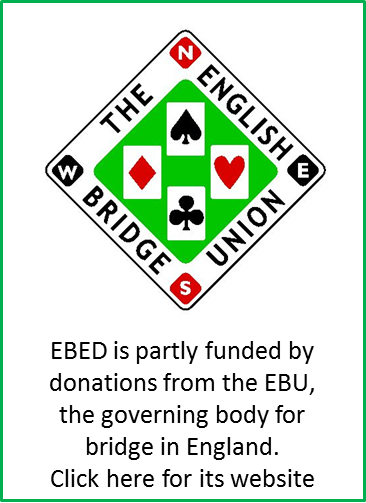 It costs just £5 a year for university bridge clubs to affiliate with the EBU. Your club members can then get all the benefits of being EBU members, you can win Master Points in your club sessions, they will count towards the NGS, and more.